Today we will check grademiners.com and find out how good and reliable it is. To make such a conclusion, it is necessary to check the prices offered, the options available, the terms and conditions of the service, and, surely, to test the service on practice by ordering a paper with them. This is what our team of professional reviewers did, and here is what was discovered. The prices for the service are above average. For example, you can get one page at High School level for $12.55, while other services offer the same for about $10. There is one more trick: the paper standard is 250 words per page, while most of other services offer 275 words per page. This may not make a difference if you need a page or two, but you will clearly feel the difference in price for a large 20-page project, overpaying for 2 pages (20*25words=500words). When placing an order, we have noticed that the price is different and it took time for us to remove the ticked extra features, such as a top writer category or updates via SMS. The form does not say that they influence the price, but after you remove them the total gets changed, so the customer needs to be attentive not to get trapped. The bonus system looks ok. Here we will see, what options are offered for the users. The deadlines start from 3 hours and the range varies up to 20 days, so one can choose whichever is suitable for them. The service seems to be good for urgent assignments, at least it claims this. The variety of deadlines changes with types of papers: you cannot get a PowerPoint presentation within more than 10 days for some reason. The list of types of assignments is quite long. Nevertheless, you will not find the option for the multiple-choice exam solution. There is also a possibility to get a Statistics project done, but the price for it significantly goes up. Ordering a PowerPoint presentation, you do not know what the standards for a slide are. Math problems are offered for ordering per problem, no matter how much work the needed problem requires. There are a lot of extra features, so you have a lot of reasons to pay more. Besides the mentioned top-writer option and updates via SMS, there is a possibility to get a professional quality check of your order, and this will double the total cost. However, doesn’t a custom writing service double check the quality of an order by default? This makes the customers who do not want to overpay worry about the quality. There is also an option to make the order of the top priority, so you will get the writer assigned as soon as possible. This option costs $10, and again, a client may wonder: when will I get a writer assigned if I decide to save those $10? As we were surprised by the 3-hour turnaround, we requested 2 pages to be completed within 3 hours. Our concerns were justified: the paper was delivered 20 minutes late. As this was a paper on technology with some text and a bit of calculation, we could check both forms of assignment completion. The grammar was quite poor, and it was obvious that not a native speaker who wrote the text. There were also a few minor mistakes in the calculation, which influenced the result. 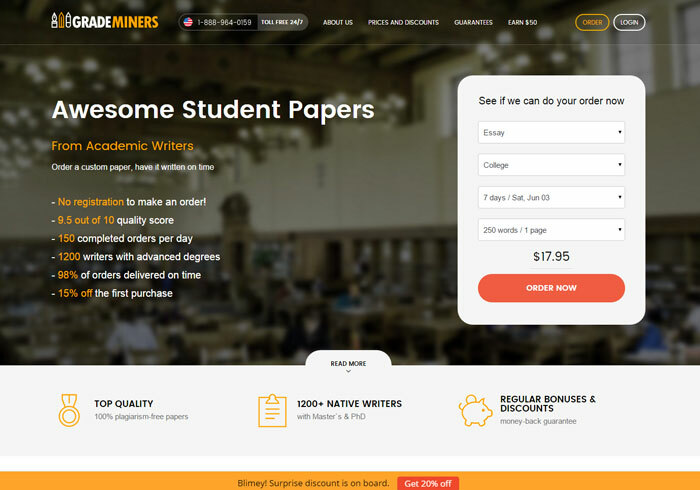 So, we can say that grademiners.com is a mediocre service, even though its prices are higher than average. So, it will not be a good idea to order with it.